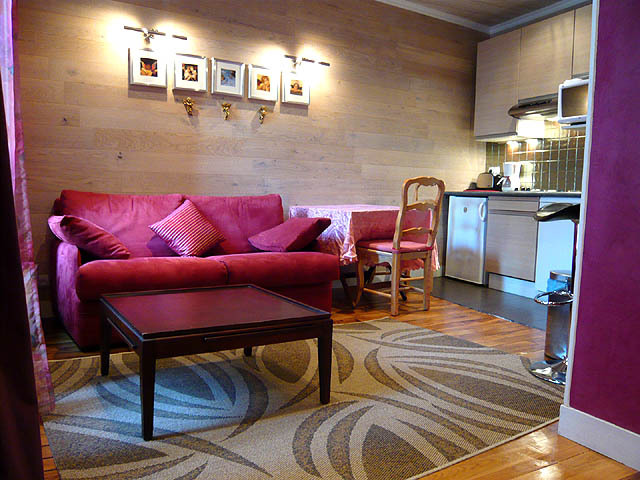 If you like that apartment, you will love RIVOLI apartment, same area. 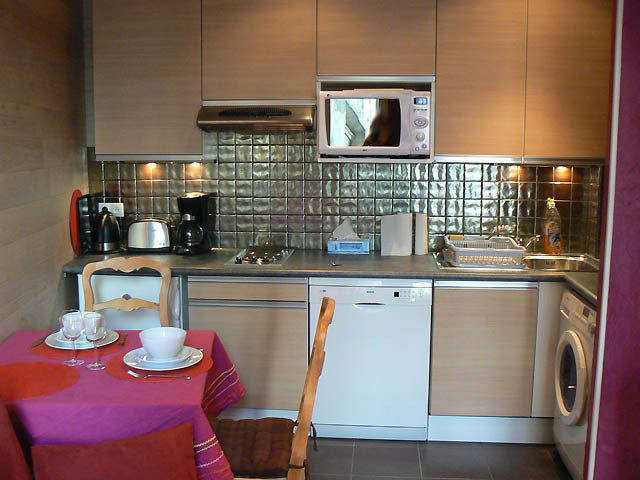 I wanted to thank you for the Bourg-Tibourg apartment, we had a great experience in Paris and the apartment was perfect for us. We have some friends coming to Paris and we will highly recommend the apartment. Or maybe will be back soon. Thank you again. My fiance and I had the pleasure of staying in this beautiful apartment. 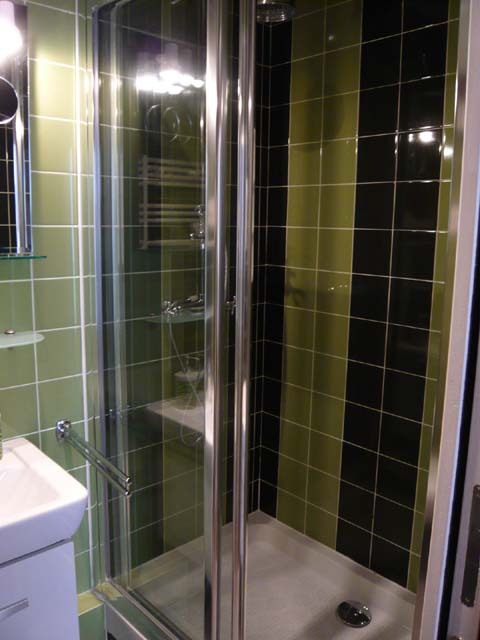 A few weeks prior we had rented another apartment from Thierry's website and we were extremely pleased with it also. We ended up having to go back to Paris for 4 days and Thierry was more than kind enough to find us somewhere to stay! The apartment is just as nice as in the pictures. it was spacious, clean and in a perfect location! We did not even want to leave the apartment because it was so nice and comfortable. It was easy for us to feel at home and feel safe. 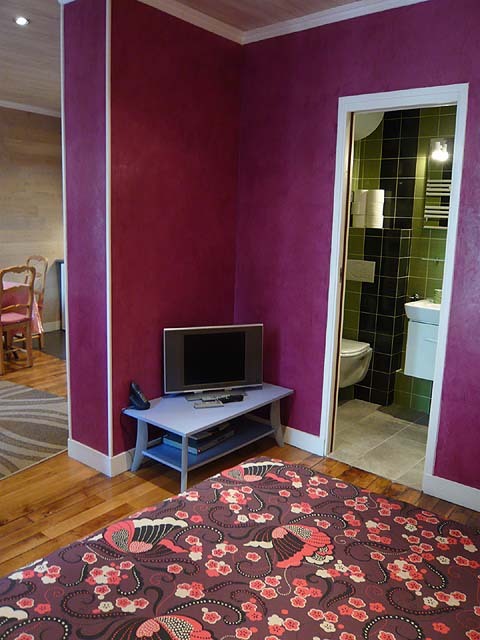 We had never rented an apartment vs. a hotel before and luck was on our side when I came across Thierry's website. I will 100% recommend him to anyone! Thierry, Thank you so much. I had such a wonderful time in Paris. It was so nice to come home to such a lovely apartment each day. I'm already planning on coming back to Paris in the near future. So when I do, I will be staying in one of your apartments again.Once again thank you. Name : Sue and Keith Richardson. Comments : Dear Thierry, We are now safely back in Australia after nine weeks in Europe. It's very cold here and we wish we were still experiencing a European summer! Thank you very much for allowing us to rent Bourg-Tibourg for the four weeks. We have wonderful memories of our time in the Marais and hope that we will be able to return at some stage in the future. The apartment was excellent for our needs and you are to be commended for the care taken in maintaining your properties and for the help provided whenever requested. We feel that we had a genuine Parisian experience. Comments: Bonjour Thierry. 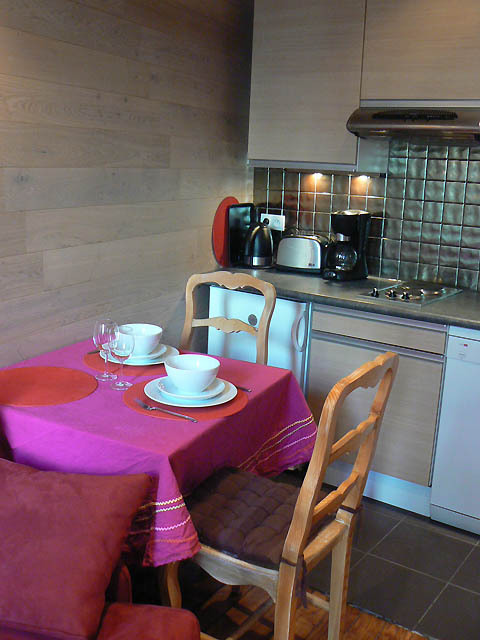 Your Bourg-Tibourg apartment was wonderful to stay in. 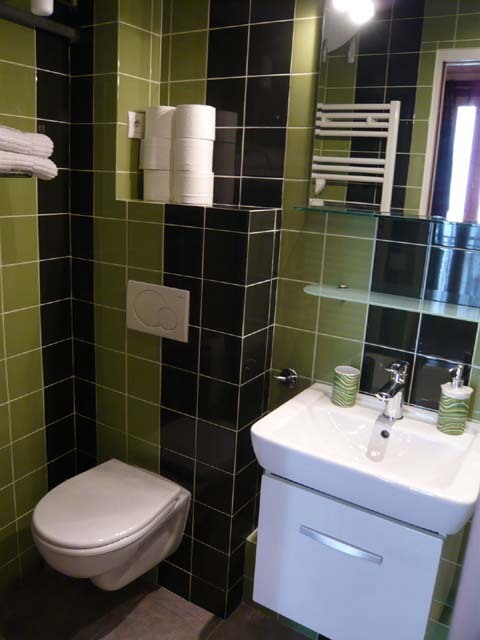 Location is perfect with Hotel de Ville metro so close by, Franprix just across the street and numerous choices of boulangeries down the street. Everything is just a hop and a skip; most certainly important with 2 kids in tow. 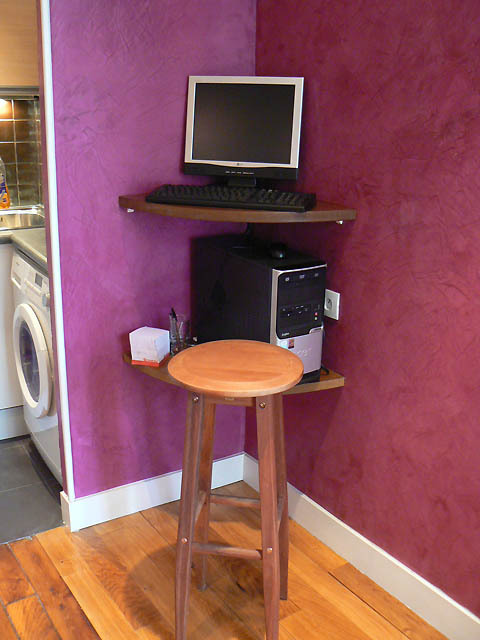 We stayed in May 2009 and your apartment showed exactly the same way as described and pictured on your website. Your apartment was well stocked with everything we needed to make ourselves at home. Thank you so much!! 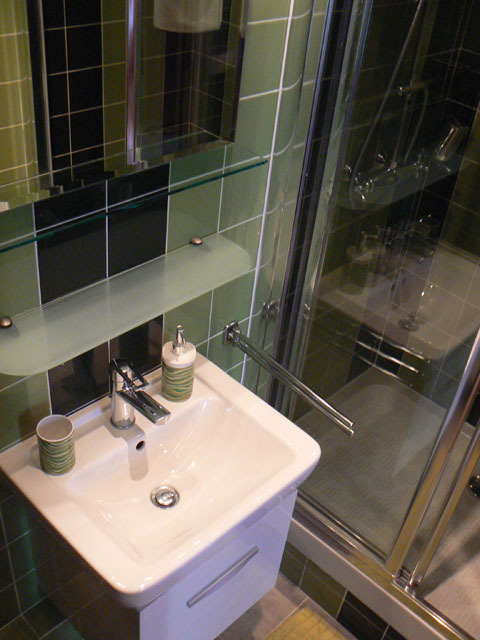 Your attention to detail to make sure your tenants are comfortable makes you a wonderful host. Your excellent communication and ease of rental process was comforting for our first visit to Paris. We will most certainly recommend you to our family and friends and hope to stay with you again on a future visit to Paris. 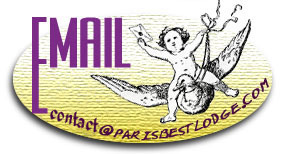 Comments: Hello Thierry, My parents, Paul and Melinda Lake, arranged for my girlfriend and I to stay at the Bourg-Tibourg in February and I just wanted to thank you for providing such wonderful accomodations. We've been back in California for almost two months and I still think fondly of our time in Paris and our amazing apartment. I will definitely recomend you to anyone I know traveling to Paris and would love to rent another of your apartments if I ever make a return trip. Thank you again, your apartment helped to make our trip truly the vacation of a lifetime! Comments: The Bourg Tibourg was delightful! It is a perfect location with convenient grocery store, fun Lizard Lounge, and delicious restaurants! And the perfumeria is a real treat. We were able to walk to the BHV department and the Hotel de Ville metro station. The entire Marais district is full of delightful discoveries! Thierry is a thoughtful host and made our visit one to remember! 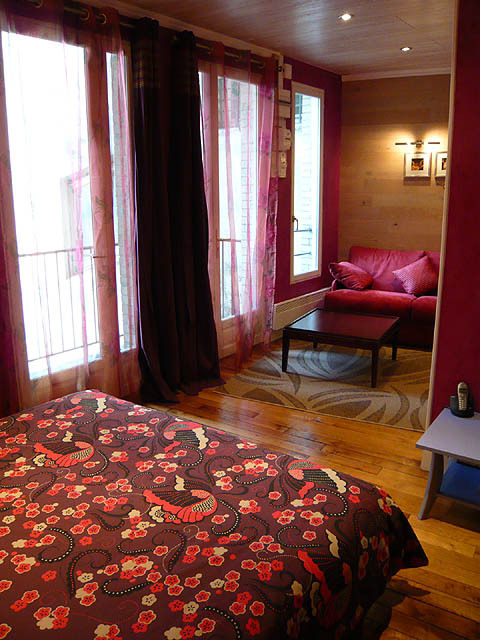 Comments: Our trip to Paris and our stay at the apartment Bourg-Tibourg was simply perfect. We were in heaven. We have recommended it to all of our friends, many of which are planning trips to Paris in the next year. We told them they simply MUST stay at one of your flats (of course, we think nothing could be better than the Bourg-Tibourg). 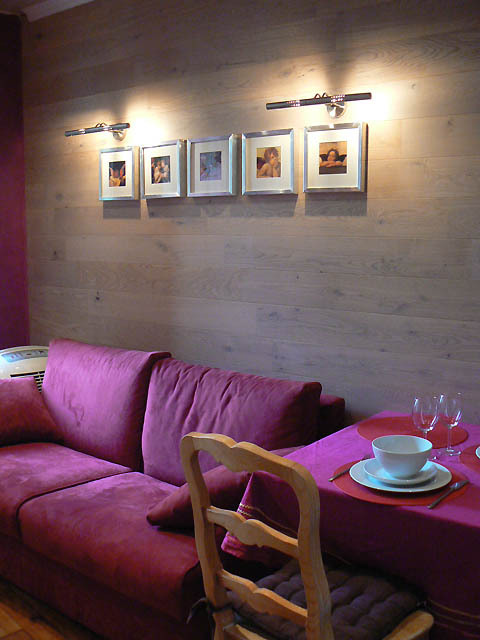 Even though the pictures online are great, they can't do justice to the warm colours and real beauty of the apartment. You have to see it for yourself! First of all, the apartment itself is so lovely. 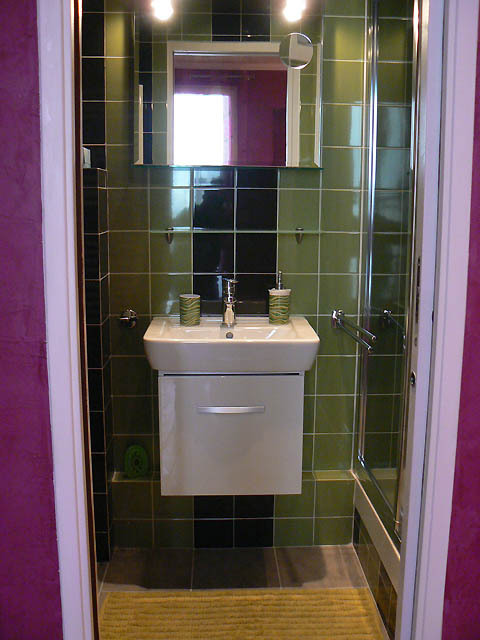 It is cozy, serene, warm, spacious and romantic, while at the same time being amazingly functional and clean. Every time we would return to the apartment, it felt like we were coming home. Thank you for that wonderful feeling! From the kitchen (with a refrigerator, toaster, microwave, 2 stovetop elements, kettle, coffee maker, dishwasher and beautiful sink) which was fully stocked with everything we could need (dishes, flatware, wine glasses, coffee, tea, dish soap, paper towels, salt and pepper, etc.) 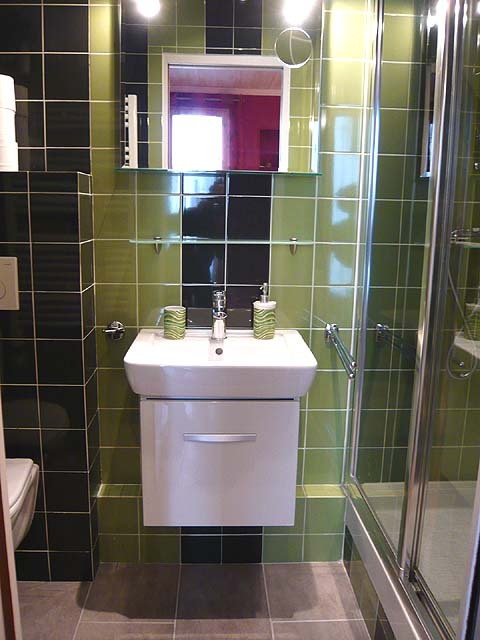 to the luxurious bathroom (gorgeous colour scheme, best shower we've ever used – like a rainfall, blow dryer, deluxe towel-warmer – and a generous supply of towels, and all the toiletries we would need, it was amazing, and so clean!) everything was outstanding. The bed was extremely comfortable and very large, the blankets were cozy and warm and we also LOVED the amount of closet space. It meant we could hide our big suitcases away and not live out of them! 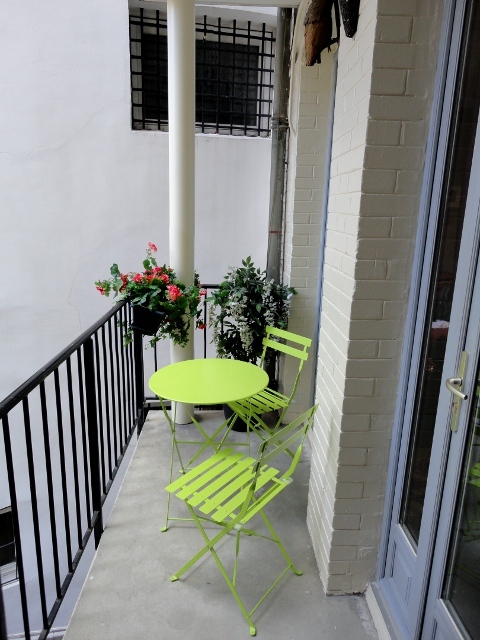 We also loved the little balcony – we'll come back and stay when the weather is warm so that we can actually sit out at the pretty little table and enjoy our tea or wine without freezing! We felt very safe and secure staying there, and the system you use for tenants to pick up the keys is perfect. On the subject of keys, it was brilliant of you to provide two sets – it meant my partner and I could enjoy our own alone time in Paris without worrying about meeting times or being locked out of our apartment waiting for the other! It was a delight to be able to enjoy such a wide range of French (and English) television, and the flat screen TV was quite a treat. On the topic of technology, it is absolutely FANTASTIC that unlimited high-speed internet is included, and the computer itself is provided (it meant I didn't have to lug my laptop overseas or worry about it being stolen). The computer was new and fast, and it helped us to plan out our daily activities (i.e. look up hours, movie times, maps, etc.) and keep in touch with family and friends at home. The local phone calls being included was another wonderful aspect of staying at your flat. And knowing that you were just on the other end of a phone call in case something went wrong was very reassuring. Thank you for being so responsible to and caring towards your guests. It could have been unnerving, staying in a strange apartment in a strange city, but knowing we had a contact "just in case" took that worry away. And, we didn't need to call you at all because everything was so perfect! It was very thoughtful of you to provide a little library of Paris guide books too. We looked through many of them to help us decide on activities we didn't want to miss! The location of the Bourg-Tibourg was perfect. There is a grocery store right across the street and two of the yummiest boulangeries (bakeries) in Paris right on our block! There are many, many, many cafes and bistros within a two-block radius, and lots of great boutiques as well! We picked up a couple of very neat, colourful espresso sets at a fun little store around the corner. There are two incredible gourmet chocolate shops on the block as well as the Mariage Freres tea store and restaurant. 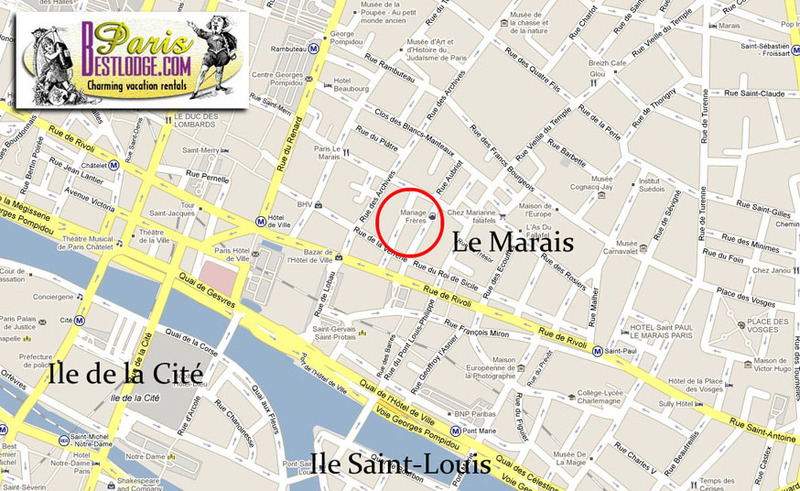 It's about a five-minute walk to Notre Dame Cathedral, about 15 minutes to the Louvre. 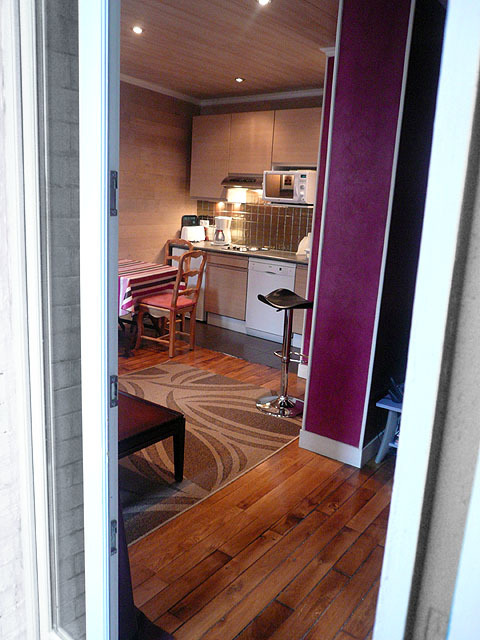 We only took the Metro twice because this apartment is in such a fantastic central location! 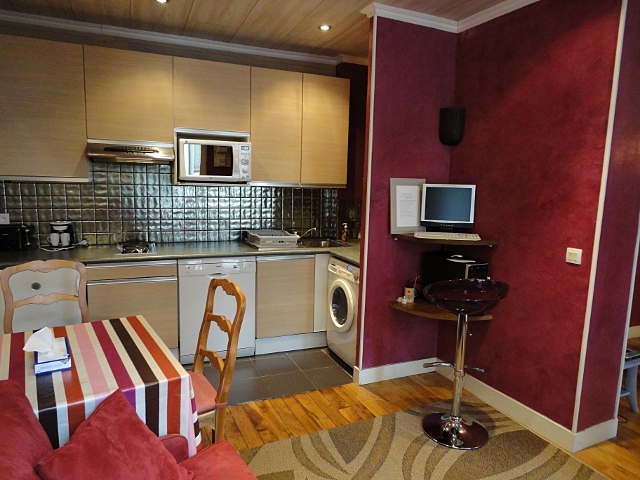 This is a stellar apartment, and you, Thierry are an incredibly sweet, hardworking and genuinely caring man. Thank you for making our first trip to Paris unforgettable. 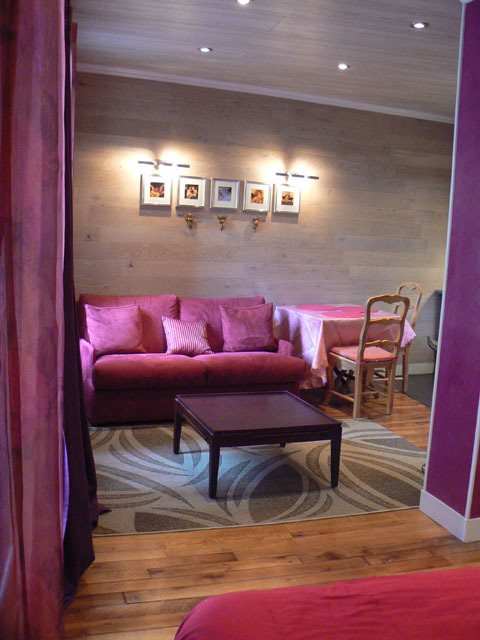 We look forward to staying at the Bourg-Tibourg again as soon as we can! If anyone would like to contact me to ask any questions about our stay or about the apartment, please let them know I would be more than happy to hear from them. Yours, Rosie Shaw and Brendan Murray. 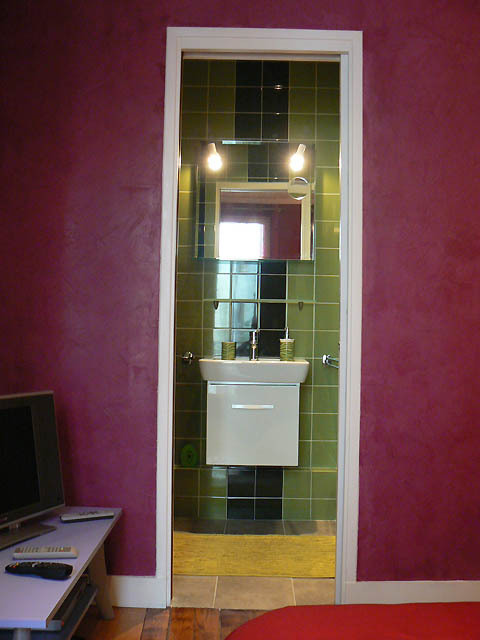 Comments: We rented the appartment Bourg Tibourg for a week's holiday. We are very happy to provide this summary of our experience, which was most favourable - giving us the basis for a memorable visit to Paris. We found the arrangements to access the flat to be easy, with the RER train from Paris CDG Airport taking us to Chatelet station nearby. The appartment owner, Thierry, met us promptly to explain the operation of the numerous modern fittings and appliances, including setting up the computer for our email. Thierry continued to be available by telephone throughout the week to help us with other information, and our departure at the end was also easy. 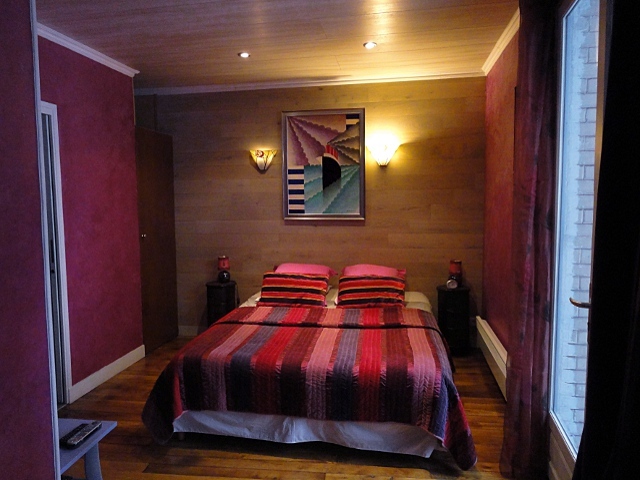 The appartment we consider to be quiet and private, although just a few metres from the vibrant streets of the Marais, and close to the bustling Rue de Rivoli. The space is compact and cosy but very well planned, with all modern conveniences and its own private little balcony - a great spot for coffee or a glass of wine. Numerous attractive sources of food and drinks are available nearby - from the most exclusive ( L'Ambroisie in the Place des Vosges ) to modest bistrots or boulangeries or wine merchants. But for us, being great walkers, perhaps the best feature of the appartment is its location within range of many of the best sights and experiences Paris has to offer.A complete list would be too long, but amongst those we enjoyed most were the Louvre, the river and its islands, Notre Dame, Place des Vosges (simply beautiful ), the Bastille, the little streets and shops of the Marais, and the wonderful museums like Carnavalet and the Picasso. For longer excursions, the Metro nearby is of course easy and efficient. 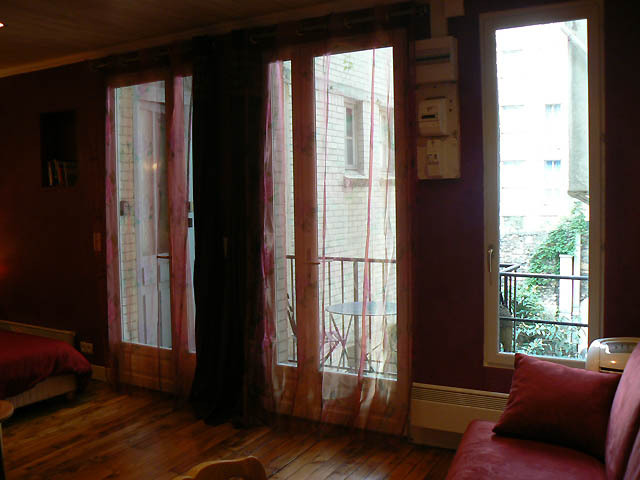 We recommend Appartment Bourg Tibourg to prospective tennants, and hope ourselves to rent it again during a future visit to Paris. Comments: This was our first trip to Paris. My husband and I loved everything about the apt. and the neighborhood. Thierry was very accommodating and helped us with the few problems we had. The location is great. Besides being close to the metro, it is such a lively neighborhood. It was very hot the week we were there so the air conditioning was appreciated. We were able to sleep comfortably. After site seeing all over Paris, I would recommend this neighborhood and this apt.